The Euroscales Avenger pallet truck scale is by far the best selling pallet truck scale in the U.K. This indicator has a very large LCD and is easily read even in areas with poor lighting. Also with it having a LCD readout instead of the more common LED the battery life is extended to over 100 hours in continuous use. Made stronger than the original truck all of the Euroscales range of trucks will take knocks that might well see others fall by the wayside. The display panel is housed in a stainless steel box for extra protection. 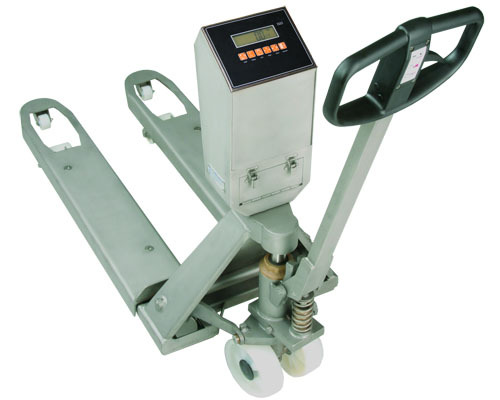 All Euroscales weighing machines are made using high quality load cells that have an excellent repeatability.The Euroscales PTS Avenger is a heavy duty pallet truck scale, combining time proven durable design with the latest innovations in industrial weighing. High Accuracy Scale 0.1% of the applied load with a capacity of the original truck.